There's nothing worse than a shabby, dog-eared business card stuffed into a pocket. 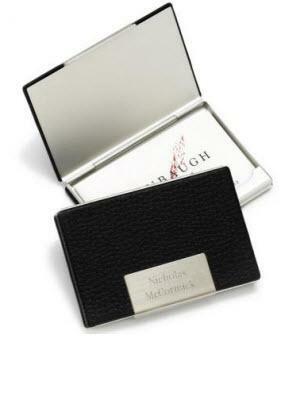 Class him or her up with this sophisticated stainless steel and leather business card holder, with stylishly engraved front plate. Perfect for graduate, sales person, corporate gift, and for anyone who carries or receives cards. Price: $27.00 In stock! - Browse this brand: JDS MarketingOur products are custom made to your specifications. This product ships up to 2 weeks after your order is placed.